The initial genesis for the design of what would becomae the B-36 Bomber traces back to the dark days of 1941 as it became clear that the United states would have to become directly involved in world War II. In those days, before Pearl Harbor, there was the very real prospect that Germany would defeat Great Britan and thus control all of Europe. In that event, the United States was going to need a bomber aircraft that could perfrom missions all the way across the Atlantic. The long range heavy bombers then in operation, or actively being developed, the B-17, the B-24, and ultimately the B-29 did not have that type of range. All would fall short. In the event that Great Britan fell, the United States needed a bomber that could fly unrefueled, perform its bombing missions, and then return to the United States until such a time as America could gain a foothold in Europe. The roundtrip from the potential fields in New Foundland to Belin was approximately 6,000 miles. But the US wanted bombers that could also take off from fields in the continental United states in the event they were required. On April 11, 1941, eight months before Pearl Harbor, the American trans-oceanic ranged strategic bomber design competition started. It was seeking a 450 mph top speed, a 275 mph cruising speed, a service ceiling of 45,000 ft., and a maximum range of 12,000 miles at 25,000 ft. After significant industrial review, these initial requirements proved too demanding and on August 19, 1941 the specifications were reduced to a maximum range of 10,000 miles with a 10,000 lb bomb load, a cruising speed of 240+ mph, and a service ceiling of 40,000 ft, which was above the maximum effective altitude of all of Nazi Germany's typically deployed anti-aircraft Flak guns. As the war progressed, and the tide of war turned in favor of the allies, production of vast numbers of B-17s, B-24s, and then B-29s took top priotity in order to exceed attrition rates and continue the massive bombing campaigns against Germany and Japan. Just the same, the Army Air Corps kept pushing for a new long-ranged bomber to reach Japan from its bases in Hawaii. So, the development of the B-36 resumed in earnest. The US Secretary of War decided to waive normal army procurement procedures, and in July 1943 ordered 100 B-36s before prototype aircraft were ever built or tested. The first aircraft delivery for this order was to be in August 1945, with the last being in October 1946. The first aircraft was unveiled by Convair on August 20, 1945, five days after Japan surrendered. With the immediate emphasis reduced, this aircraft did not fly for the first time until August 8, 1946. She was a huge aircraft, as well she would have to be to meet the requirements. She has six massive pusher piston engines mounted on a wing that spanned 230 feet. To this day this is the largest wingspan of any mass produced combat aircraft in history. The massive wing was seven and one-half feet thick and had a service pathway to the piston engines internally that allowed the engines to be worked on by the crew while in flight. The aircraft dwarfed the B-29 Superfortress which was the largest World War II bomber aircraft and which had delivered the nuclear bombs to Heroshima and Nagaskai that ended World War II. After World war II, relations with the USSR soured rapidly. Even though the US and her allies had worked together with the USSR to defeat Nazi Germany, the USSR itself developed into another brutal dictatorship that had visions itself of formenting communist revolution throughout the world and ultimatly controlling the world. Once the USSR developed nuclear weapons of its own, the need for the B-36 became paramount. Now, the massive weapons load, the tremendous range, and the relative high speed and high atlitude of the B-36 became the natural tool to deter the Soviet Union. 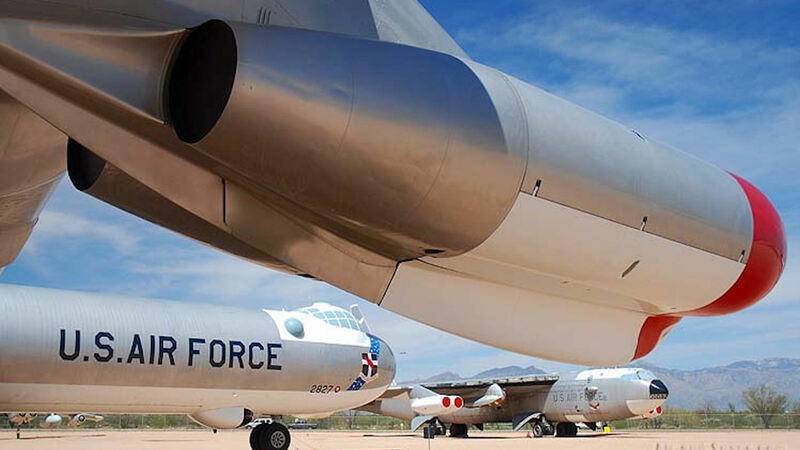 The United States formed the US Air Force as a separate, indepenedent setrvice branch in 1947 and all B-36 bombers were immediately transferred to the USAF. Modifictions were made to make the aircraft suitable for the new task of deterring the USSR. Her cockpit was redesigned and placed atop the fuselage. She got more powerful engines. In her new role of strategic deterrance, she became operational in 1949 and more orders were placed with production runs that would continue through 1954. The confrontation between the US and her allies (The West) and the USSR and her allies (The East) was named the "Cold War," after the Berlin airlift of 1948, and particularly after the Soviet Union's first successful nuclear bomb detonation in 1949. The B-36 was the only American aircraft with the range and payload to carry all of the United States nuclear inventory from airfields on American soil to targets in the USSR. 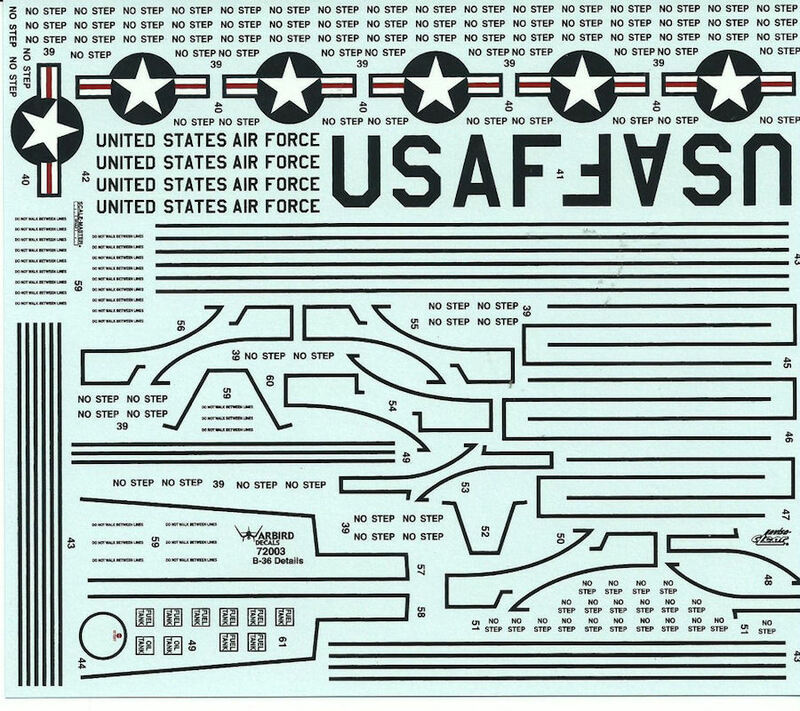 In order to carry the largest US nuclear weapons, the bomb bays had to be combined and the modification to allow this was called the "Grand Slam Installation." Soon, B-36 bombers were available in numbers and operating from US air baises in the United States and from air bases of allies in Europe and the Western Pacific. Despite its capabilities, the B-36 was designed in the era of piston enjines driving propellers. In the late 1940s and throughout the 1950s, the jet age was ushered in. The "jet age" actually started towards the end of World War II when the *** introduced the first production jet fighter, the Me-262 twin engined fighter. But it began in earnest at the end of the 1940s and into the 1950s. In order to increase speed and range, the B-36 underwent a transformation that brough it into the jet age. In addition to its six massive psiton engines, four jet engines were added. These were house outboard of the piston engines in a single nacelle on each wing which housed two of the jet engines. Because of its unique nature with so many piston and jet engines, the crews of the B-36 often indicated that the had, "Six tuning and four burning." Despite this, as time progressed in the 1950s, the B-36 was rapidly becoming obsolete. It was too slow and as time went on, was simply not capable of penetrating growing Soviet defenses with the high degree of success required for its nuclear delivery requirements. However, it's first jet rival, the Boeing B-47 Stratojet, which became fully operational in 1953, lacked the range to attack the Soviet homeland from North America without aerial refueling and could not carry the huge first-generation Mark 16 hydrogen bomb. So, the B-36 served on, and General Curtis Lemay, the head of the US Air Force Strategic Air Command, kept the B-36 force, through intense training and development, an effective force to deliver nuclear weapons. During this time, the B-36 was the heart of the Strategic Air Command force. Its maximum payload was greater than any other bomber in the US inventory, including the newly developed B-52 which entered service in 1955. Although the B-36 was slow and could not refuel in midair, she could fly missions to intercontinental targets and stay aloft for up to 40 hours at a time. In addition, through the mid and late 1950s, the B-36 maintained a phenomenal cruising altitude which made it possible for her to fly above the capabilities of most Soviet interceptors of the day, as well as their ground-based anti aircraft guns. Nonetheless, the introduction of the B-52 in 1955 changed everything. This was clearly the aircraft that would replace the B-36. The B-52 was faster, it could fly as high and higher, and it could be refueled in mid-air giving it essentially unlimited range. Through the late 1950s the B-52 fleet grew, supplanting the B-36, and in 1959, the last B-36 strategic bomber aircraft were retired. In addition, supersonic intercontinetal bombers were being developed, including the Mach 2 B-58 hustler, which went into service in the 1960s, and the even faster, higher flying and very exotic B-70 Valykerie, which was canclled. with the advnet of Intercontinental Ballist Missiles (ICBMs) beginning in the 1960s, aircraft like the B-36 were rendered completely, irrevocably obsolote. The newer, faster jet bombers served on due to America's desire to maintain a triad of nuclear deliver options, but the B-36 had seen its day. I have had this model for some time but did not intend to build it for a couple of more years. However, over the Thanksgiving break this year, I once again watched the old movie, "Strategic Air Command," starring Jimmy Stewart. The movie features the B-36 heavily and I was moved to go ahead and move up the B-36 in my build queue. I am writing this part of my model review as a tribute to Jimmy Stewart. Many people do not know it, but in addition to Jimmy Stewart being one of my favorite all time movie stars, he was also a great American patriot and military hero. Though already a very successful movie star when Wolrd War II broke out, he was also a very successful aircraft racer. It was one of his hobbies and he was very good at it, winning numerous races, medals, and honors in the late 1930s. But he came from a patrriotic family, where his grandfathers and father had served in the US military. So when it became apparent to him that war was inevitable, he went down and inlisted in the US Army in March 1941, over eight months before Pearl Harbor. He did not ask for any favors thoiugh he had a college degree, was 33 years old and was very well known. No, Jimmy Stewrart enlisted as a simple private. When it was learned that he had significant flying experience, in addition to a college degree, he was transferred to the Army Air Coprs. At 33 years of age, he was already six years older than the maximum age for new pilot recruits, but because the need was great, and because of his experience, this requirement was waived and he was inducted as a pilot. He was commissioned a Lt. in the USAAC in January 1942, one month after Pearl Harbor. He wanted to go fight, but because of his age and noteriety, he remained state side, training others. In that role he was steadily promoted through Captain and to Major. But he continued to put in for combat duty, and finally, in 1943 it was granted. He was transferred to England in command of the 703rd Bomber Squadron, flying B-24 Liberator bombers against Germany. while flying for the 703rd, he earned the Distinguished Flying Cross for his efforts leading major bomber raids against the heavily defended 3rd Reich. He was promoted to the Operations Officer for the entire 453rd Bomber Group and continued flying combat missions. In January 1944 he was prmoted to Lt. 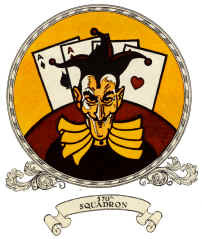 Colonel and assigned to the 2nd Bomber Wing as the Executive Officer, the second in command of the entire bomber wing. While commanding, he continued to seek out and fly comnbat missions. He was very much liked by the flyers, who recognized in him an individual who did not have to serve, and who set aside his noteriety for the better good and put himself at risk just like the rest of them. During 1944, as a result of his actions while flying against the enemy, Jimmy stewart earned a 2nd Distignusihed Flying Cross and the Croix de Guerre from the French. He also earned the Air Medal with three Oak Clustrers during this time. In March 1945, he was promoted to a full colonel and in May 1945, he was given command of the entire 2nd Bomber wing in England of the US Army Air Coprs. He was one of only a few people who rose from the rank of private to that of Colonel in four years time. In all, he successfully flew 20 combat missions against the Germans. After the war, and returning home, he remained in the reserves. He became a US Air Force reservist when the US Air Force was created in 1947...but Jimmy Stewart, though back acting, was not done serving his country. Throughout the 1950s, as a Colonel, he served and became qualified to fly the B-36 Peacmaker. This was the largest US bomber ever created, and the heart and sole of America's first line defense and deterence against the Soviet UNion in thoughout the 1950s. But Jimmy Stewart was an excellent pilot and had proven his capabilities as a decorated combat verteran. When the new jet bombers began coming out, with the B-47 being the first, he bacame qualified in that aircratf as well. He flew those aircraft for the Strategic Air Command as well, and as a reservixst he would have been ammong the first called up to combat in the event of war. In July 1959, Jimmy stewart was promoted to the rank of Brigadier General. He continued to serve, and continued to qualify. He became qualified to fly the B-52 Bomber, which became operational in 1955, and still serves as a part of the US Air Force bomber arsenal today. In fact, Jimmy Stewart's last official military flight, was a combat mission in the B-52, where he flew as a US Air Force command observer in February 1966 over Vietnam on an Arclight mission against the North Vietnamese. As was his nature, he sought no accolades or press for this action. Very few people knew about it unitl much later. He was, afterall, a very successful, well known, and popular actor at the time. But this did not stop him from continuing to put his life on the line for his country. Jimmy stewart retired from the US Air Force as a General in 1968, after 27 years of service to his country. I include his brief military history here because he flew the B-36 Peacemaker, and because he was a truly great American, in addition to being a wonderful and talented actor. Tamiya began building large, 1/350 scale model vessels back in the 1980s and has been doing so ever since. They make OUTSTANDING 1/350 scale model kits for naval vessels. 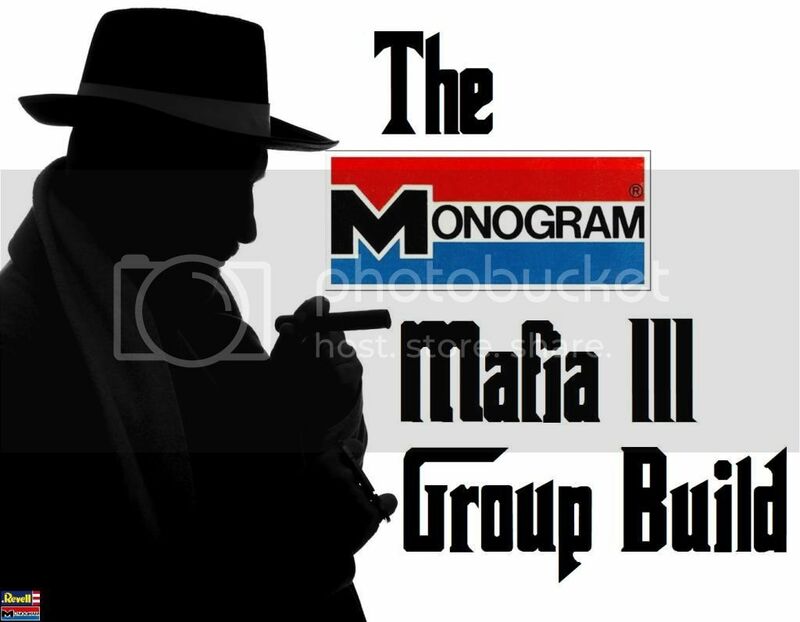 Monogram has historically been one of the better model builders in the United States. They put out several versions of the aircraft in 1/72 scale, and this version, kit number 5707 is my favorite. 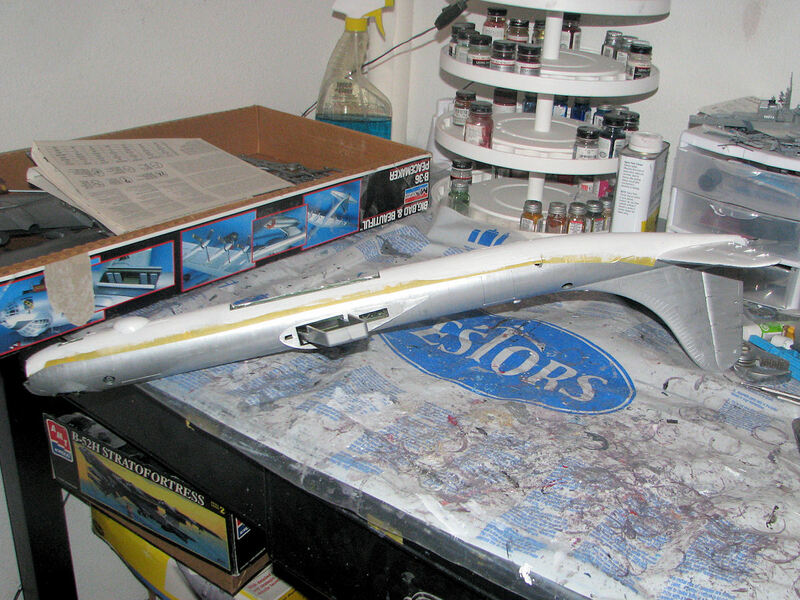 It is the largest 1/72 scale aircraft model ever made, and is a truly momouth model. 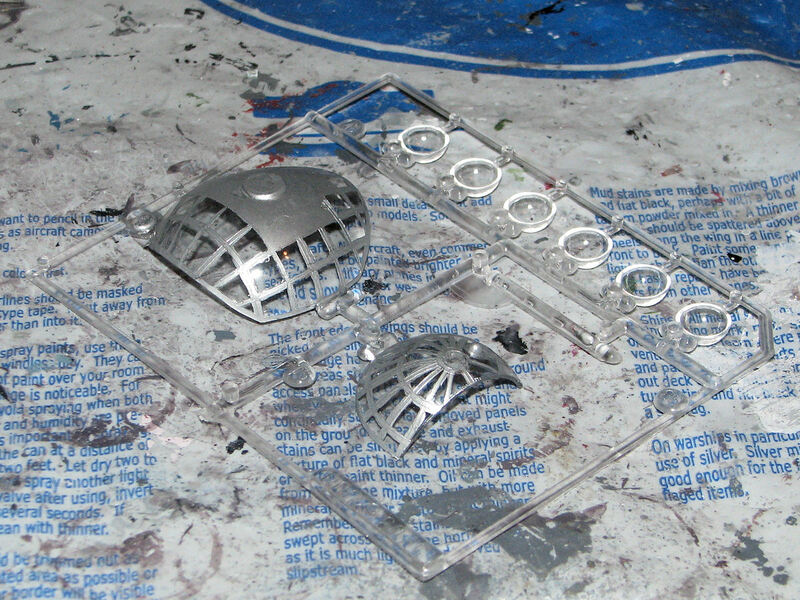 It comes with seven sprues (six molded in gray and one in clear plastci) with about 150 parts. The two fueslage halves are separate parts. There are a number of nice features and details. The props can all be built to turn, the guns (in the noce and tail) can move, the bombay can be shwon open with a significant conventional bomb load. One issue is that the long connecting tunned between the nose cockpit area and the after sectrion which includes the tail gunner and a rather large crew area, is missing. So if you want to be accruate yyoul will have to scratch build that. I intend to show the bombay open with some nuclear weapons ands the long tunnel that traverses through it. The parts have a decent amount of detail, including the cockpit area. There is very little flash (although the model I have was produced in the 1980s). I purchased couple of sets of aftermarket decals from Warbird. Number 72003 which gives the standard maintenance stencils and walkway stripes for the B-36 including all of the stripes and warning markings for the aircraft, and number 72032 which includes aircraft markings for the "Broken Arrow" aircraft (which I will not model), and the "City of Ft. worth" aircraft, which I intend to model. These are excellent decals and each shee has a MRP of $14.99. I found mine on ebay for $8.99 each. Here is the model with its box, the parts, the decals and the instructions:. The completion of the PLAN Carrier group was centered on the already completed Trumpeter's 1/350 scale PLA Navy's Aircraft Carrier CV-16, Liaoning, (in addition to the other escorts already completed) included Mini Hobby's's PLAN Guangzhou, DDG-168. I recently pre-ordered a 1/350 scale model of the PLAN Type 071 LPD, Yuzhao Class, announced by Trumpeter and due out in October, 2013. I will end up adding two of those, propbably LPD-998 Yuzhao and LPD-999, Jinggangshan, add the PLAN- DDG-139, Ningbo, and the PLAN DDG-115, Shenyang, along with the PLAN Weifang, FFG-550 and thus build a PLAN ARG. The completion of the US Carrier Strike group was centered on the completed Tamyia's 1/350 scale USS Enterprise, CVN-65, (in addition ot the other escorts already completed) included Trumpeter's, USS Freedom, LCS-1, Dragon's USS Preble, DDG-88 and Hobby Boss's USS Texas, SSN-775. When a 1/350 scale USS Enterprise, CVN-80 (or any Gerald R. Ford Class) is released from Trumpeter, Tamiya, Dragon, or whomever else, I will add it to this group along with another AEGIS Cruiser. Whichever Ford Class coms out in 1/350 scale, I will build it as the USS Enterprise, CVN-80. The completion of the UK Group featured the Airfix 1/350 scale HMS Illustrious, R06 as its centerp[iece until a 1/350 scale Queen Elizabeth carrier is released. When that happens, I will add that carrier to the group as its centerpiece. The Royal Navy CSG will also include two Airfix 1/350 scale Daring Class DDGs (one of which is already completed), two Trumpeter 1/350 scale Type 23 HMS Duke class Frigates (one of which is already completed), and the Hobby Boss 1/350 scale HMS Astute SSN (which is also already completed) and Airfix 1/350 scale HMS Tragalgar SSN. One day, when a 1/350 scale HMS Ocean LPD come out, I will use tt to start building a Royal Navy ARG. The French CSG was completed and is centered on Heller's 1/400 scale Charles De Gualle, R91. I also built the 1/400 scale Heller French De Grasse, D612 DDG, which is an ASW DDG, and the French Aconit D612 FFG and Gueprattet F714 FFGs, both of which are Lafayette class frigates. These four vessels round out my French CSG. As soon as a French Robin class nuclear sub, like the French Perale S606 SSN is released in 1/350 or 1/400 scale, I will add that to the group. Also as soon as the Forbin D620, Horizon class anti-air DDG is released in 1/350 or 1/400 scale, I will purchase it and add it to the CSG. One day, when the models come out, I will purchase two 1/350 scale Mistral Class LPDs so I can create a French ARG with those vessels. The completion of the Japanese JMSDF group was centered on Fujimi's very finely detailed, 1/350 scale Hyuga, DDH-181. It will be escorted by Trumpeter's 1/350 scale DDG-177, Atago, an AEGIS class DDG and the JMSDF, DDG-174, Kongo class (which I own), Trumpeters's 1/350 scale DDG-114 Susunami and DDG-111 (both of which are Takinami Class DDGs which I own), and by the 1/350 scale SS-503 Hakuryu (which I own), one of Japans new, very modern and capable AIP Diesel Electric submarines. As soon as a DDG-115 Akizuki in 1/350 scale is released, I will add it to this group. Should a 1/350 scale Osumi Class LPD be relased, I will buy two of those vessels and create a JMSDF ARG. The completion of the Russian CSG (centered on Trumpeter's Kuznetsov which I own) the Russian Kirov Class nuclear battle cruiser (CGN), the Peter the Great, by Trumpeter (which I own), the Russian Slava Class cruiser, Varyag by Trumperter, a Trumpeter 1/350 scale Udaloy DDG, Hobby Boss's Akula II class SSN, the new Yasen class Russian SSN, and the Zevzda Oscar II SSGN, all in 1/350 scale. Recently I purchased Heller's 1/400 scale Foch, the Clemceau Class carrier that was sold to the Brazilians in 2000 and in 2002 was refitted and became the Brazilian CV, Sao Paulo, using steam catapaults. I built the model as the Sao Paulo and thus started a Brazilian group. I will need to find a 1/350 scale Type 22 DDGs and the FFGs the Brazilians use which are not available at present. I did purchased a set of 1/400 scale A-4 Skyhawks and S-3 Trackers and built those as a suitable airwing for the Sao Paulo. Thanks for the run-down here Jeff! 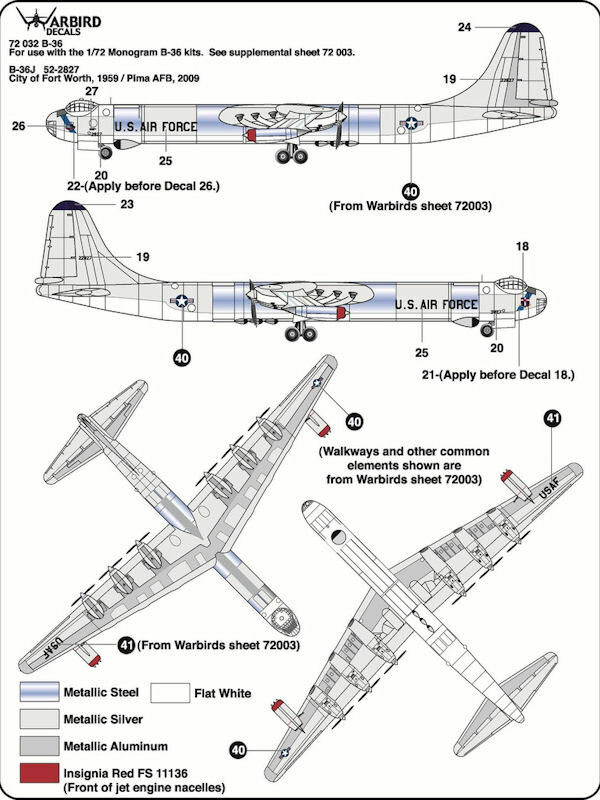 I knew the B-36 was a big plane but seeing it making the B-29 look like a toy- WHOA! And knew about Stewart's Second World War service but had no idea he'd continued after the end of the war. I am going to be getting into the building of this this weekend...and am looking forward to it. It is a HUGE model...I just have to find place to put it when I am done with it. And yes, Stewart served through until 1968 and retired with 27 years in the military. He was a great actor and a great man. Wow, that was a great write-up. I built this kit about 5 years ago. It overwhelmed my modeling space (and that space is quite large, not to brag or anything). It hangs from the ceiling in my workshop, built wheels up with custom nose art and a fictional story to go along with it. I called her the 'Texas Squaw' with a scantily-clad native American gal on the opposite side of the fuselage. She represents a what-if bomber in a world where Germany defeated all of Europe and the United States was forced to go it alone against the *** well into the late 1940s. true story, a couple years ago I got to listen to a speech at my church by a 90-year-old man who has set records for marathon running. He was wearing a polo with a B-36 embroidered on the chest, so I knew he would have some stories to tell about something other than his fantastic marathon records. Indeed he did not disappoint. He told of how, many years after the fact, he as able to visit Moscow, where he wen to the spot where he, as a bombardier, would have dropped an A-bomb had that order ever come. Thankfully that order never came. Thanks Jeff....very informative. I knew the B-36 was huge....but as others have said...wow! At one time the Monogram B-29 was the largest kit ever. Imgine this guy in 1/48th....lol. I look forward to your build. When I was stationed at Chanute AFB in Champaign Urbana, they had one on display on the base. I can say from personal first hand experience, it is one HUGE bird. Very impressive write up, thanks. You may find this interesting. Check out the space inside. OOFF !! This is a huge aircraft! Thank you for the information provided. I will definately follow your WIP! I'm pulling up a seat on this one Jeff! Ty so much for the Jimmy Stewart history, I had no idea and this was fascinating information. I will be watching your WIP in ernest. I may try 1 myself. IP (instructor pilot) in the late 1950s. He was traininhg Vietnamese pilots. At that time I had never heard of Viet Nam. That would change. I spent several months visiting him in the summer and have a picture of me standing next to the B-36's main langing gear and the tire is a few feet higher than me. It is indeed a huge aircraft. That B-36 has been disassembled and moved to an AFB out west IIRC. The base was closed a number of years ago and I think it is now a county airport. Champagn-Urbanna IL is very close to the University of IL. There is a Museum on the grounds and several of the Air Force aircraft are on display, e.g. a T-33. One other memory was the training exercise of the firefighters where a B-29 was burned. This is a nice kit and IIRC was at that time one of the largest kits ever done by Monogram. Enjoy the build. Added thought: Chanute Field, later Chanute Air Force Base, was named for Octavious Chanute an aviation pioneer and scientist. The Wright brothers beat him to flight, but not by much. If I recall correctly there is a B-36 at The US Air Force Museum. There may be some helpful pictures for your build. Oh, yes. Chanute AFB in Rantoul, IL. I went through Aircraft Maintenance Officer school there. Graduated in April, 1975. As I recall the training was in Trumper Hall. I remember the Aircraft Electrical Systems instructor, R. P. Phillips. What a great instructor! He had some of the best and funniest stories I had heard up to that time in my life. Brings back many memories. They got so many ice storms there that I carried a screwdriver in my brief case to help me get in my car at the end of the day. Heres a Rantoul memory for you, The "Piggly Wiggly" grocery store. I began this session by doing a little research on how the cockpit should appear, and then gathering all of the patrts for the cockpit, and forward crew areas (navigator and radar operator stations). This also included the two forward 20mm cannons in their auto turret on the upper nose of the aircraft. I then painted all of these parts to match the photos OI had seen...although most of the photos were from a B-36 being refurbished for a museum and some of the parts (like the head rests, straps, etc.) were not there. It is interesting because with the B-36 the entrior was still painted similar to the world War II bombers with a green painting for the enterior, black instrumentation, with white dials, and with olive drab seats. I made the headrests black, and the straps a gray with aluminum colored clasps. 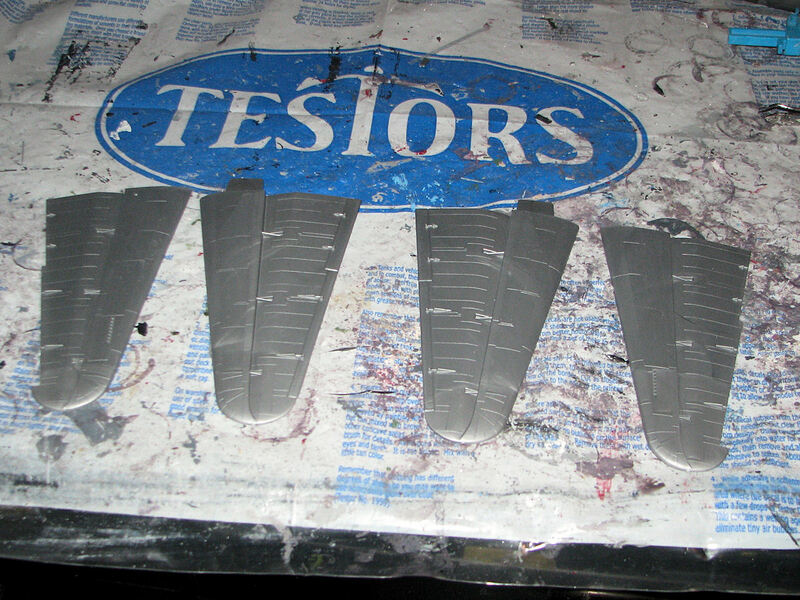 Omce this was completed, it was time to paint the enterior of the fuselage halves and then attach the two flight decks to the fuselage. There is alos a view port on each side with instrumentation to do navigtion by obseving the stars or the heavens. The following pictures are meant to show what I intend when I deal with the bomb bay. There is a tunnel that connetcs the forward crew areas of the aircraft with the rear crew areas. in the reatr areas yo uave access to the reary gun turrest, but also have soome bunks, comm equipment, and a small galley. Anyhow, I intend to put the access tunnel through the bomb bay as it existed on these aircraft which is not included in the model. You can see the tunnel in the first picture, and then how it goes through the bomb bay in the second, with the overall location in the third. Then, I intend to replace the numerous conventional 500lb bombs that come with the kit with a Mark 17, Hyrdodgen bombs from the 1950s. When introduced, the B-36 was the only aircraft that could carry them and I intend to put one in the bomb bay for this aircraft. I know that there is a company that makes 1/72 scale Mark 17s, I will just have to find it and wsee if they still have them...or scratch build my own. Anyhow, I hope in the next session to add the tunnel, and then add the rear gun turret and then glue togewther the fuselage halves. I started this session by gathering the parts for the bomb bay, including the access tunnel I created, and then painting them. I made the access tunnel by simply finding a felt-tip marker with the right diamter housing, cutting it to fit, and then painting it. Hehehe...no need to get too fancy. 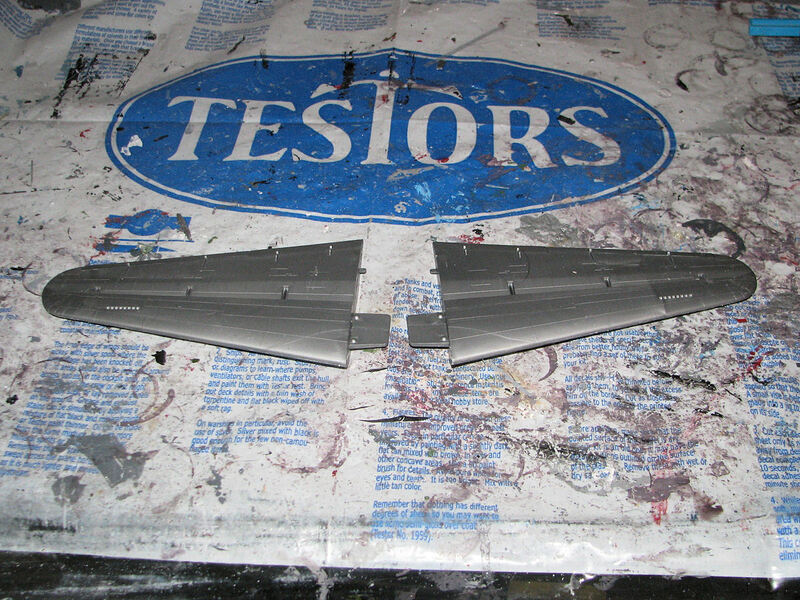 I then glued these parts in place and then dry fit the fuselage halves to see how they would fit. I found that with the tunnel, it conflicted with the large support spar that the model has for the huge wings to attach to the model, so I had to trim that spar a bit to make it fit. 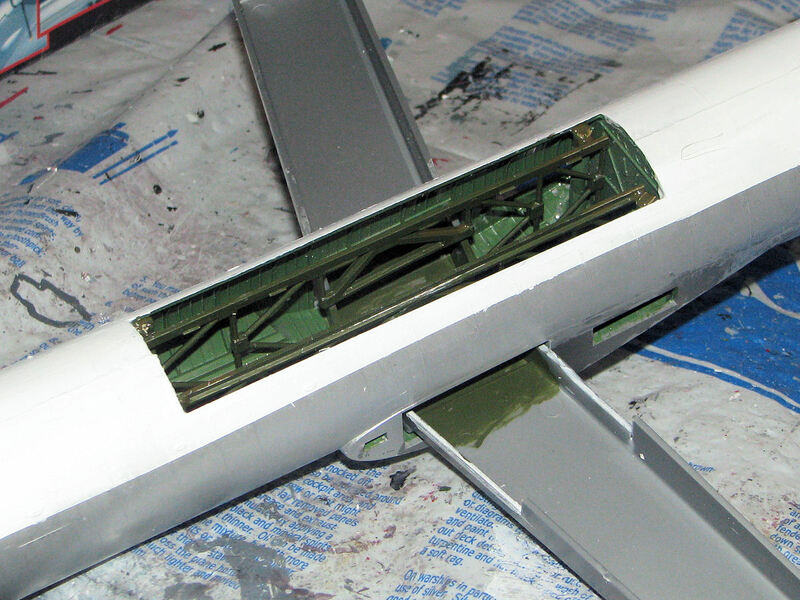 Once this was completed, I then added come more of the navigation instrumentation to the view ports on the aft halves of the fuselage, then inserted the wing support spar into the right fuselage half, and then glued the two fuselage halves together. It went together very well, but there are some seam issues you will want to either file or sand down to improve the look. All in all, though it came together nicely. 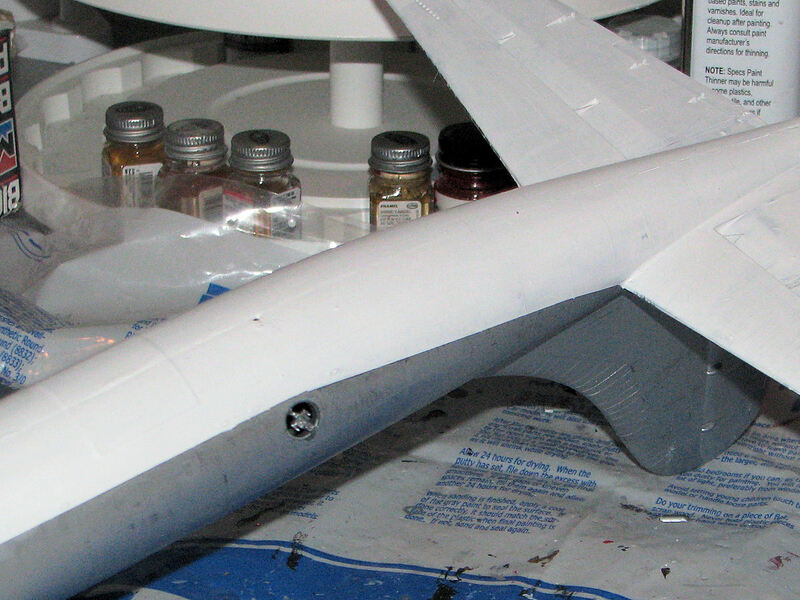 At this point I decided to paint the upper portion of the entire fuselage, including the vertical stabilzior. This is painted in the Strategic Air command (SAC) Silver color. I used Model Master Silver. This is looking very nice at this point. It is really a mammoth model. The wing span is actually quite a bit wider than the aircraft is long so it will be really testing my table to even be able to get it on here! LOL! 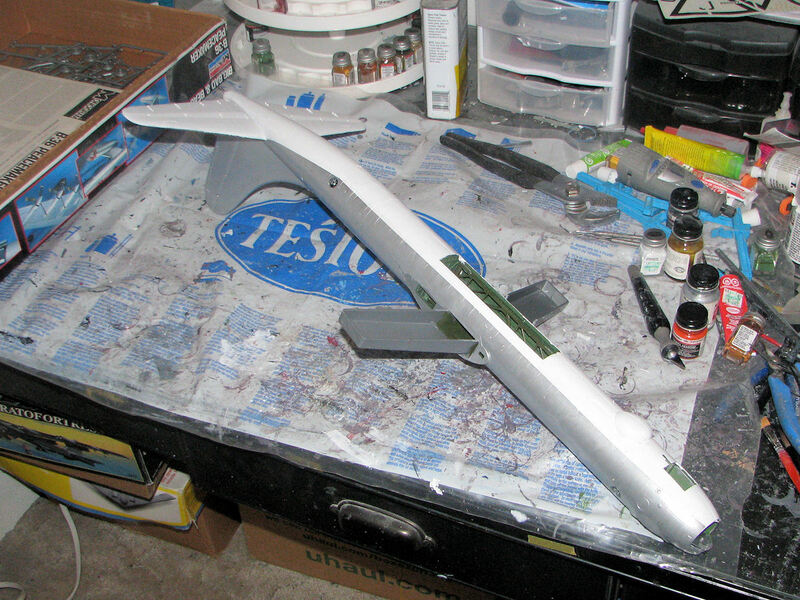 I will paint the lower portion of the fuselage (about the lower 1/3) in flat white per the SAC color scheme at the time in the next session. I hope to get the engines built and attach the horizontal stabilizors during that session. I love the B-36, especially the ones with natural metal finish. I'll definitely want to follow you on this build! I'd build one myself but it would take up so much space. I am worried about the space too...hehehe. I am pretty sure I have just enough space on the bench to finish this. But I am not sure where I will put it. I have used up most of my space with 1/350 ships, including six modern carriers, an LHD (Iwo Jima), two LPDs, and all of their escorts.. But they are long and narrow...not long and wide! I have just about convinced the "boss girl," to ceed me a complete room for the hobby. Right now I have an alcove in our master bedroom. We raised five kids and they are all grown and moved away now with families of their own. We have kept three bedrooms available for visits...but I am proposing we reduuce that to two. As I say, I am on the verge of getting a dispensation...LOL! B-1B, B-52, B-2, B-70, Tu-160, Tu-95M, Tu-22M, Space Shuttle, Saturn V, with the card tower set, and the 1/144 Space Station. Those will fill up a LOT of space! Jeff, when I finished mine I built a new display case for it. Luckily I have a space near my desk that used to have a wood stove and a good size case fit there. Here is a link to my B-36 build log, there is a picture of the display case there. Until I had the case finished I had to keep the B-36 locked in a back room because there are two very inquisitive cats in the house. "Piggly Wiggly," there's one I haven't heard of for quite some time, Rangerj! Used to shop in one of those in Kilgore, TX. Pretty common in that part of the country. What a beautiful build and a beautiful display cabinet to put it in. Thank you for sharing, you have given me some ideas in finishing my own. Yep...I can remember Piggly Wiggly in the small North Central Texas town I was raised near. We were on a ranch about five miles out of town and I can remember going in there to get a Dr. Pepper if we were hauling hay over that way. Had not thought of Piggly Wiggly in some time. 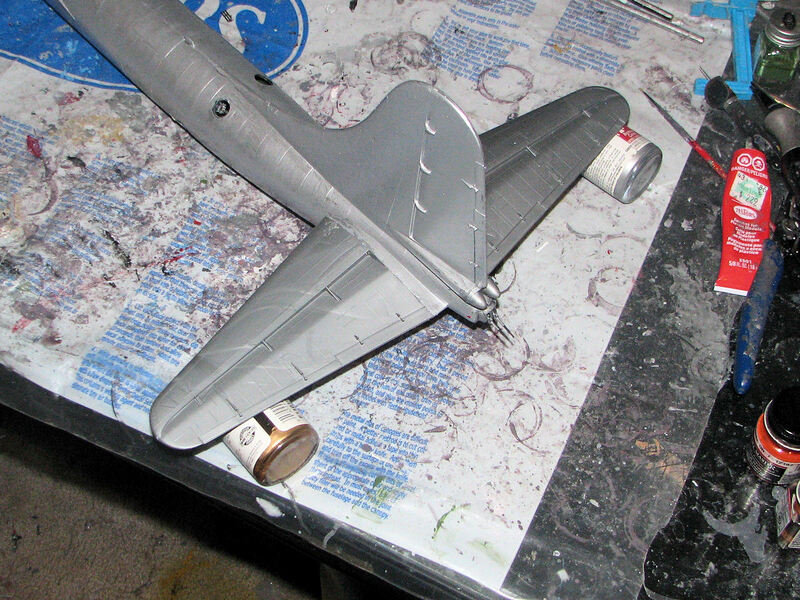 Jeff, I am dealing with the space issue as I am working on a 1/48 B-29. My thought was to hang it from the cealing, or some how suspend it from a shelf. I have an old style intertainment center where it would hang at about eye level! I am definately following your build Jeff as I have great interest in this behemoth of a plane. TY for posting and for the detailed info therein. Also ty for following me too, it's quite an honor. I came this close to buying this kit at the last IPMS show but as others have said, I didn't have enough work space on my tiny bench to support the build. 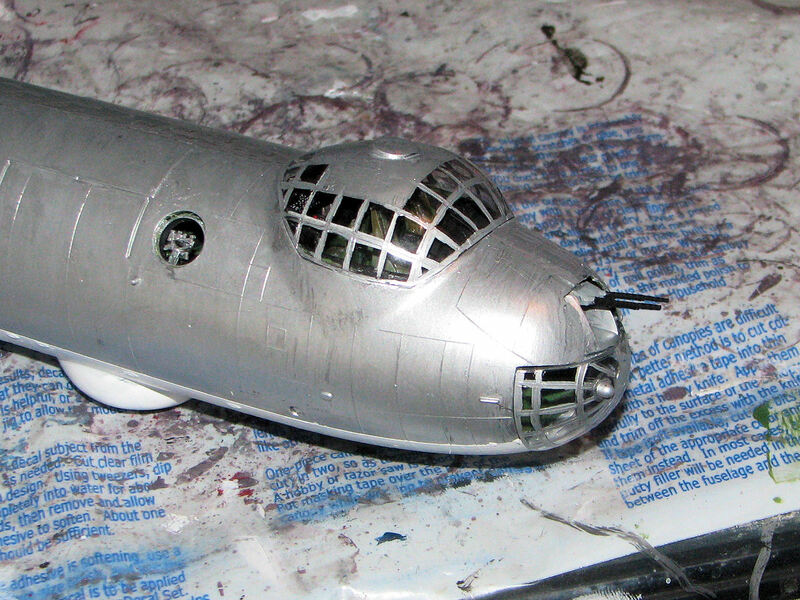 Even my 1/48 B-26 took some imaginative manipulation to complete, so I passed on this one....sigh. Hi Jeff! I'm DEFINITELY going to be watching your build here. 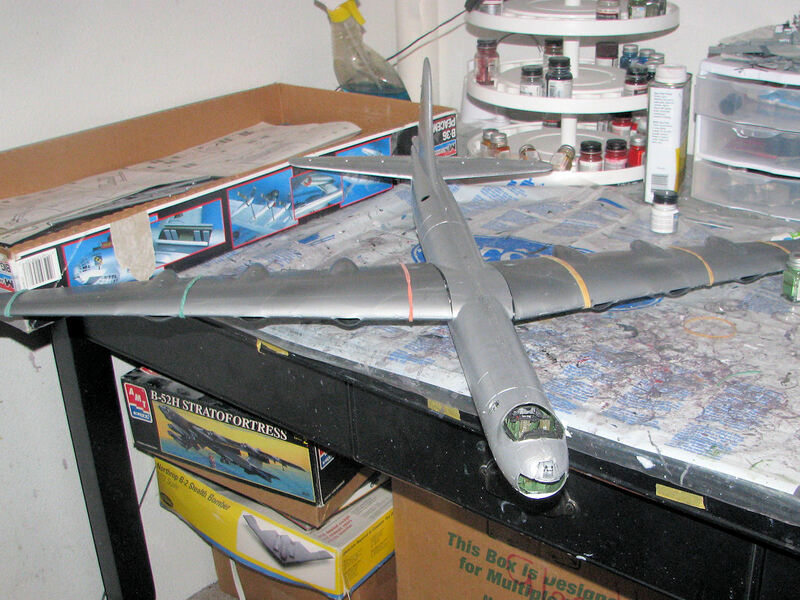 The B-36 kit is a fun one to build. I've built three of them so far: One got destroyed in a move, the second one is at my dad's place and I've got the third one. When my dad was a kid growing up in CA, he used to see them flying overhead. He even saw a flying wing overhead as well! What a time to be growing up. Anywho, I just wanted to point out a couple of things. In your posts, you had mention some navigation ports with instrumentation. Are you talking about the clear spherical blisters? If so, those were actually the gun sights used by the gunners on the B-36. It's actually very similar in nature to the ones used on the B-29. 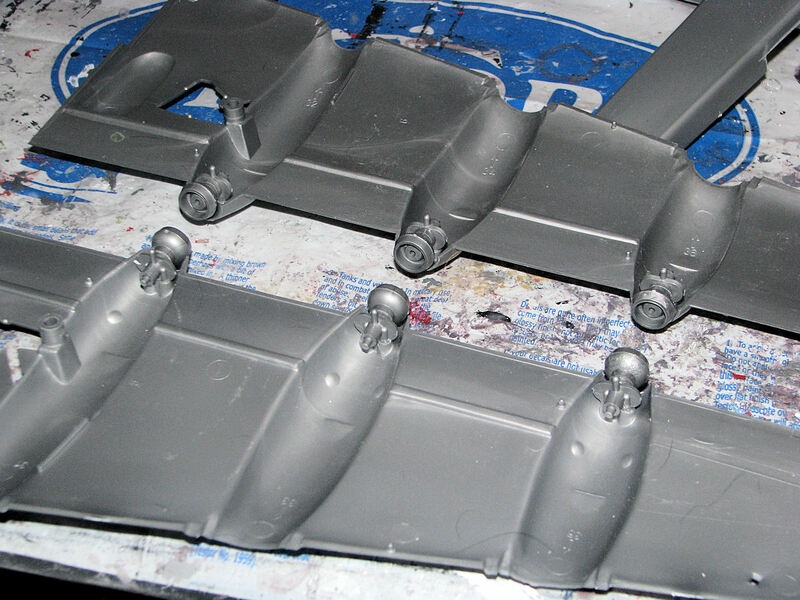 Also, in the B-36 kit, the bombs depicted are actually T-86 photo flash bombs used for recon purposes. They could carry up to 80 of them. I've always wished the kit came with a full compliment of 500 or 1000 pound general purpose bombs. That would be neat to see! Your kit is coming along great! Keep up the good work and I can't wait to see how it turns out. I Love this plane and model. I have built the Revell Germany version of this aircraft in 1/72nd scale. That version has the full walkway decals and additional jet engine pods. It has to be the biggest decal sheet I've ever seen. I'll try to find some photos. 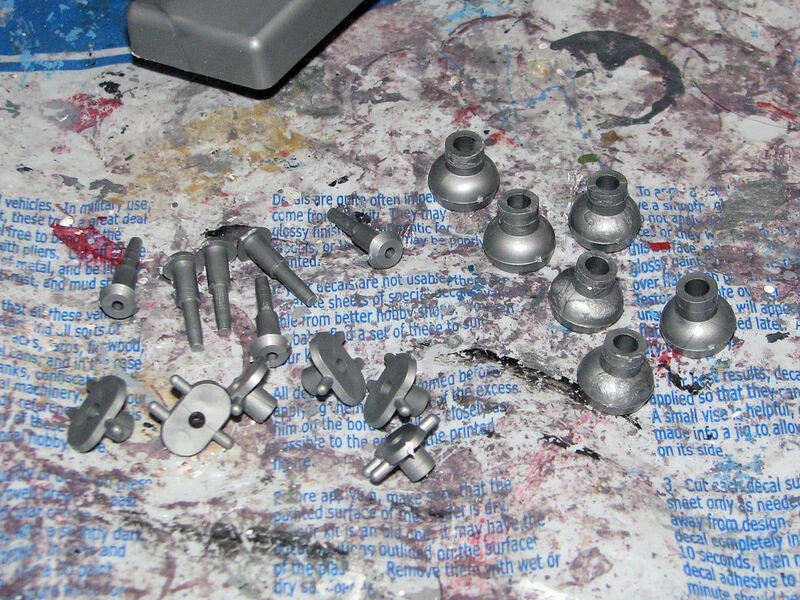 You'll be decaling for a month after painting all the metal paint variences of color. Take your time and really enjoy this build. I store this thing vertically on two ladder hooks If you can belive that. Can you imagine if the real "Wilbur Wright" actually laid eyes on this aircraft??? Maybe my favorite plane of all time. Loved that the Jimmy Stewart movie as well! Thanks for the pointers! It's definitely a fun build. I am posting my next progress report today. ..has the full walkway decals and additional jet engine pods. It has to be the biggest decal sheet I've ever seen. I'll try to find some photos. Maybe my favorite plane of all time! I puirchased a couple of after market decal sets for the aircraft by Warbird and am looking forward to getting to that point and adding them. But I am still a ways away from that. Thanks for the comments. Yes, Jimmy Stewart was quite the person...you would never know of his military background very much unless you research it and look at histories of the man. He earned two Distinguished Flying crosses in world War II in combat over Germany flying B-24s, the French Croix de Greurre, and Air Medals as well. Again, thanks for the post! I started this session by building the horizontal stabilizers and then adding them to the aircraft. 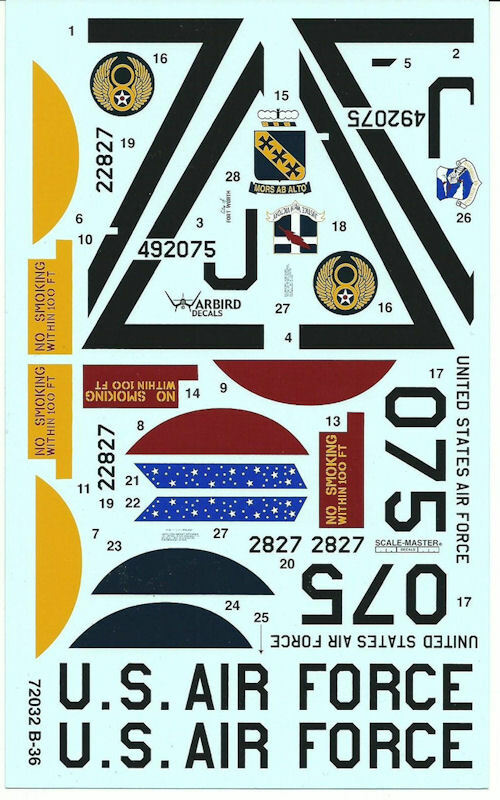 Pretty straight forward, but the span of these are as big or bigger than most full wing spans on 1/72 scale fighter and attack aircraft models. 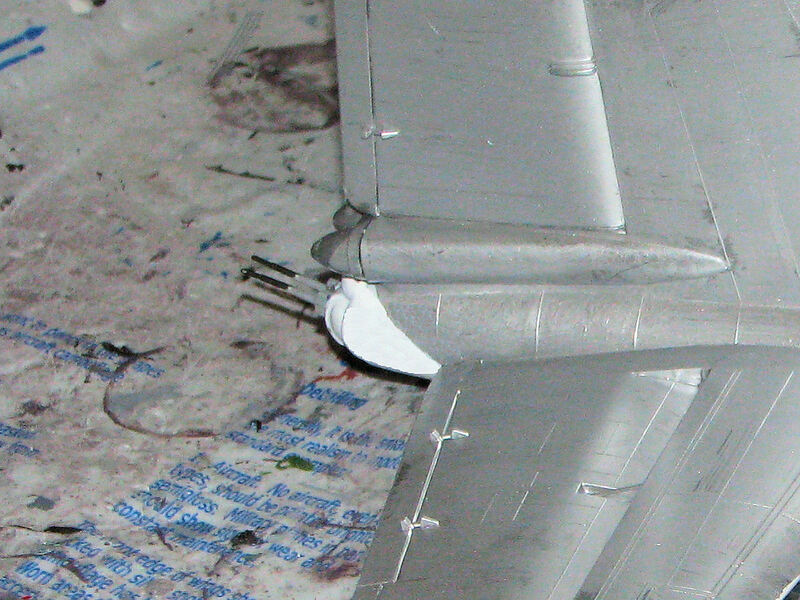 I then painted the lower fuselage in the flat white as it was in service. I used Model Master Flat White. It took a full three coats to get it covered adequately. 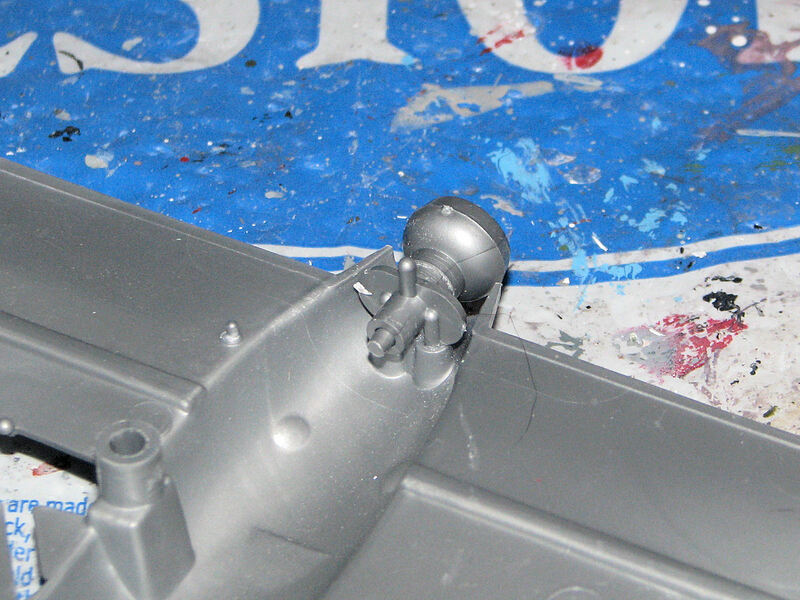 I then touched up the bomb bay, the rear gun turret area, etc. At this point I decided to paint the canopy and the forward nose section. 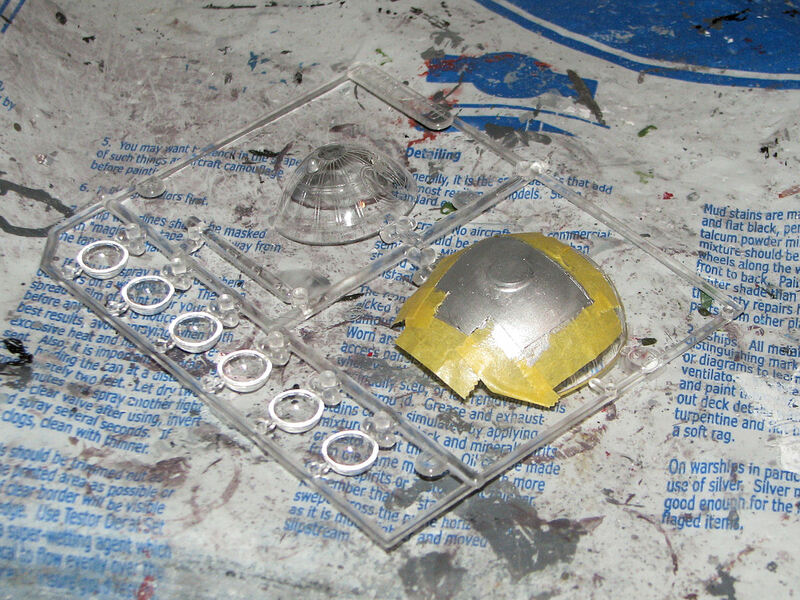 These come in clear plastic and you have to mask and paint the supporting structure. I masked the larger areas, and then used a fine brush to paint the straight lines freehand. They turned out very well. I will not permanently attach these until the model is completed...but I wanted to dry fit/tape fit them to see how it was looking. I'm pretty satisfied with the results. 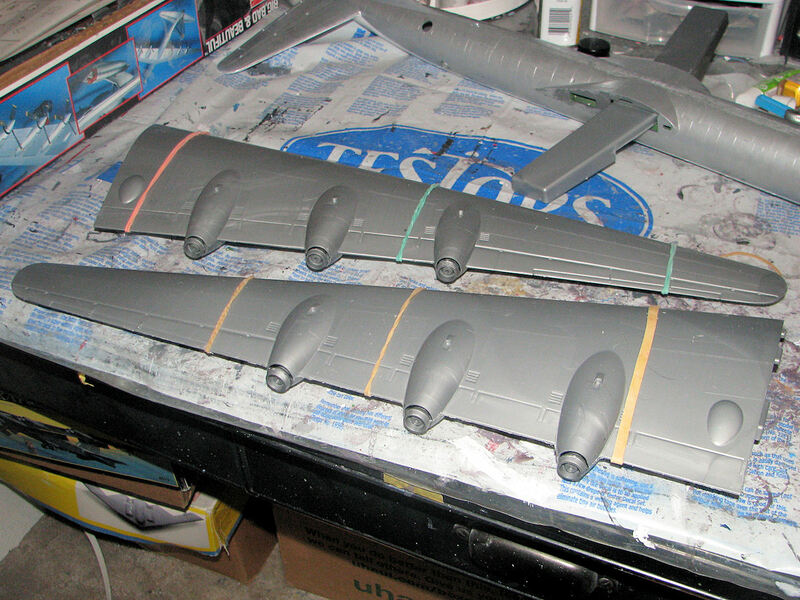 I then assembled and attached the prop mounts for the six large piston engines that the B-36 uses. These are massive engines, but on the B-36 they were "pusher" engines, meaning the propellers were mounted on the back of the wings and the blades orientd so that they "pushed" the aircraft forward, rather than being mounted in front of the wing and pulling the aircraft forward like most aircraft. Once these were mounted and dried, I was then able to glue the large wings together. These wings are massive. In real life they are 7' thick at the root and actually had access tunnels to the engines. The engines could be feathered and stopped for a crewman to perform basic maintenance if necessary while in flight. At least, that is what I have been told, I have no idea if that ever happened. 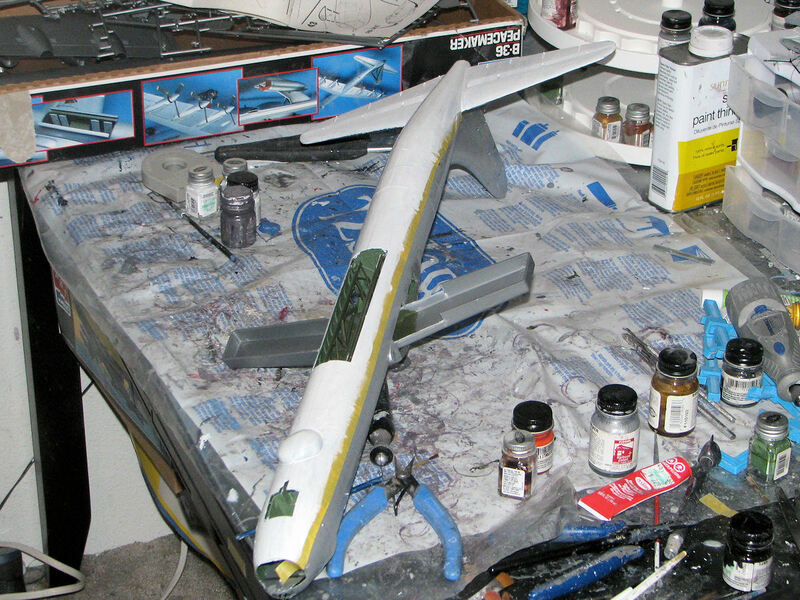 Once they dried, I then did a quick dry fit of them to the aircraft just to show the overall size of the aircraft now. As I say...it is stretching my build area pretty much to the max. In the next session I will paint these massive wings, paint the props, build and paint the jet engines and their nacelles, build the langing gear, and then hopefully attach all of that to each wing preparatory to actually atttaching the wings to the aircraft. If time permits, I will attach the wings in the next session.